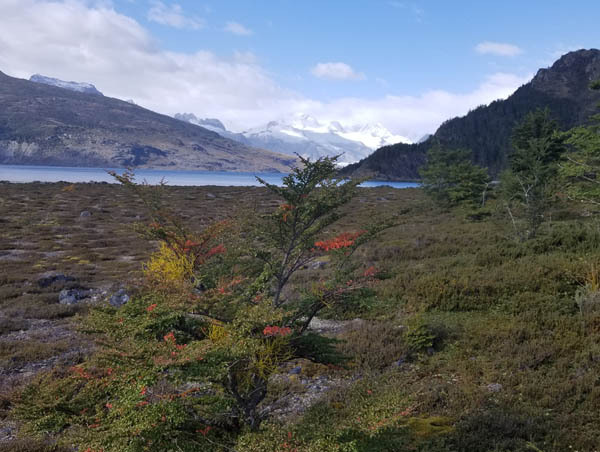 Patagonia--To the end of the earth! 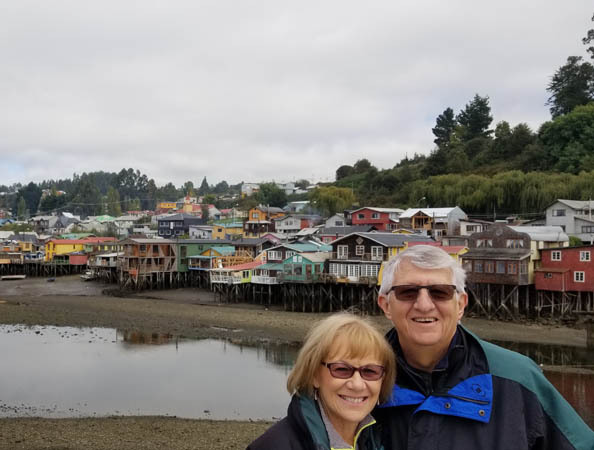 Our first three weeks were spent touring this distinct region encompassing the southern parts of Chile and Argentina. With the Andes as the dividing line, the region spreads from the Atlantic to the Pacific Ocean from the tip of South America to an ambiguous border on the north. 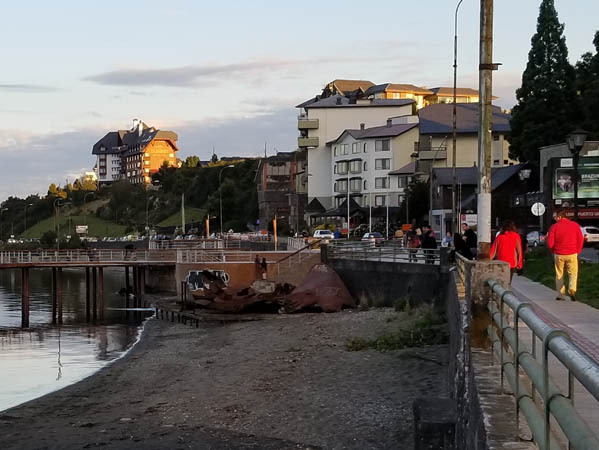 Punta Arenas, Chile is located on the Strait of Magellan that connects the Atlantic and Pacific Oceans. Prior to the Panama Canal, it was a major seaport but now it is mostly a tourist town for cruises around the tip of South America and to Antarctica. Serendipity or Divine Intervention?? We met Jorge standing in line to board our plane in Santiago. 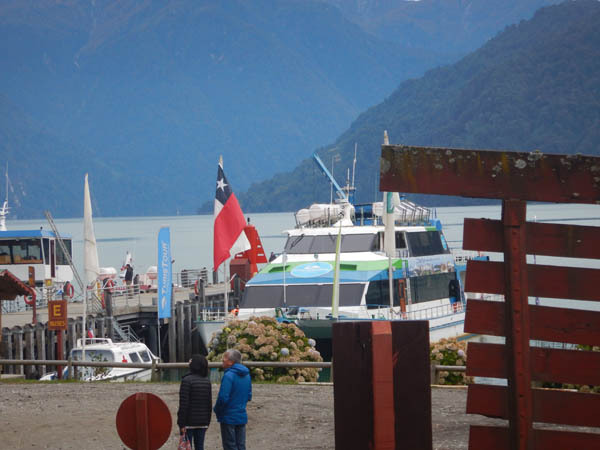 The next day Larry had lost his Chilean Visa and we accidently bumped into Jorge who spent an hour shuttling us to different people until he got Larry a new one. A true blessing! The cemetery was noted as a must see and as we toured it found out why. 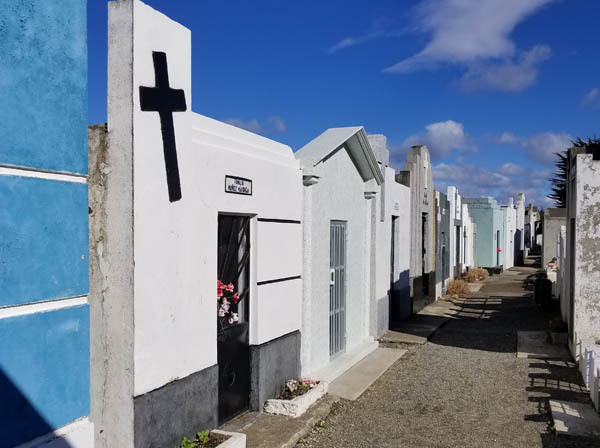 It is filled with what we would consider as "tiny houses" as final resting place for entire families of affluent pioneers and immigrants. 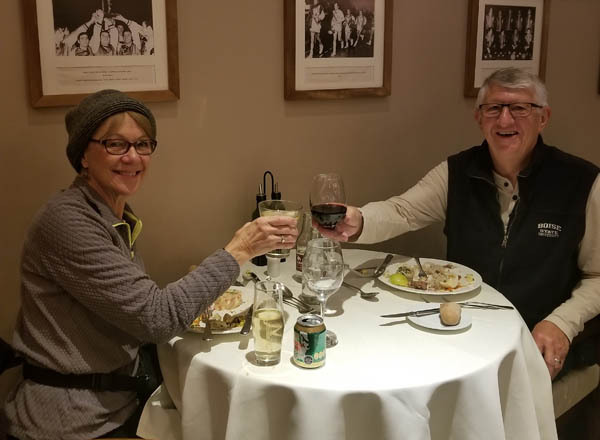 On March 23, Glorine turned 70 years old and we made it a grand celebration at this fine restaurant in the Dreams Casino. We were hoping to win enough money to pay for the meal, but no such luck. 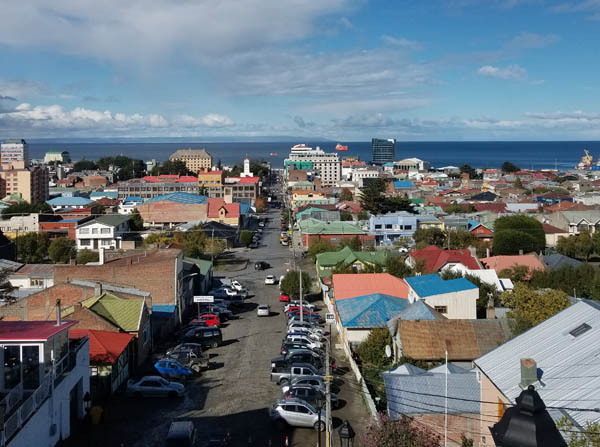 Punta Arenas is where we began our five-day cruise around the tip of South America. The blue lines indicate the route we took. 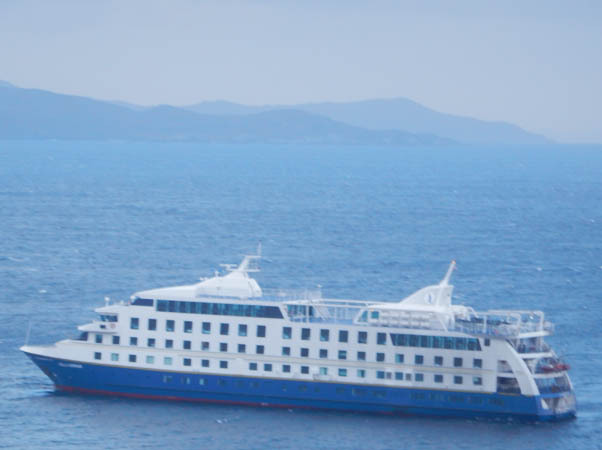 This ship is a 200-passenger cruise liner designed for tight passages and rough sea, which we encountered a couple times during the trip. This was the view from our berth, a cozy room with two comfortable twin beds and a private bathroom. 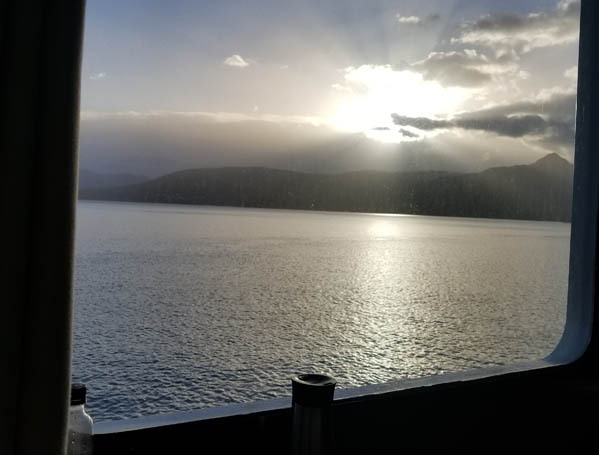 At times, the waters were so calm and the room so quiet, it was hard to believe we were on a ship. 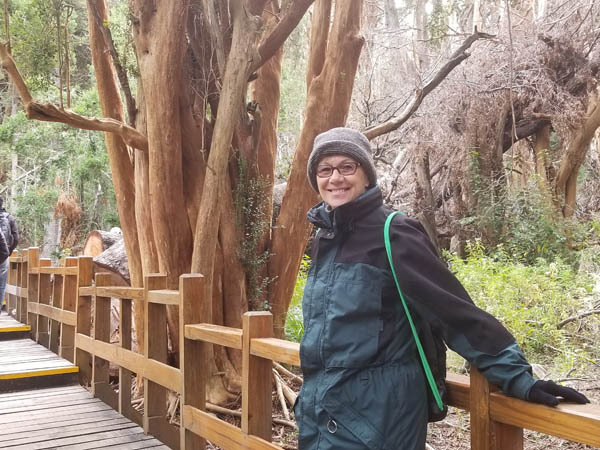 We took two excursions on each day of our trip. The man in red, William, a young German who spoke five languages was able to cater to the diverse tourist on board. He was an awesome tour guide. 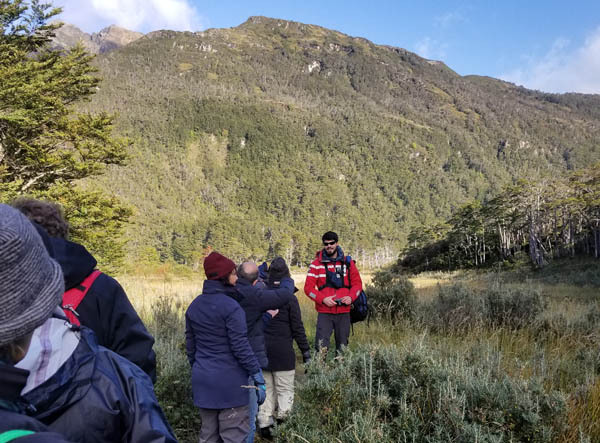 On one excursion, we learned that when the glaciers receded 12,000 years ago, lichens and mosses began to form which later evolved into the rich flora of the area that later attracted the animals that could survive this hostile environment. 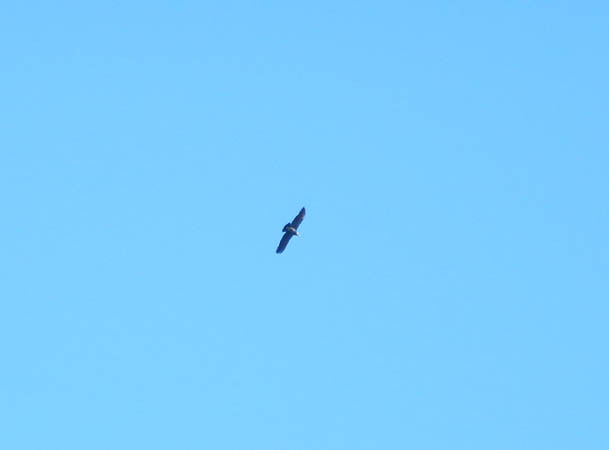 We were fortunate to take a picture of one of these creatures--Andean Condor, the largest flying bird in the world by combined weight and wingspan. The largest wingspan measured nearly eleven feet. 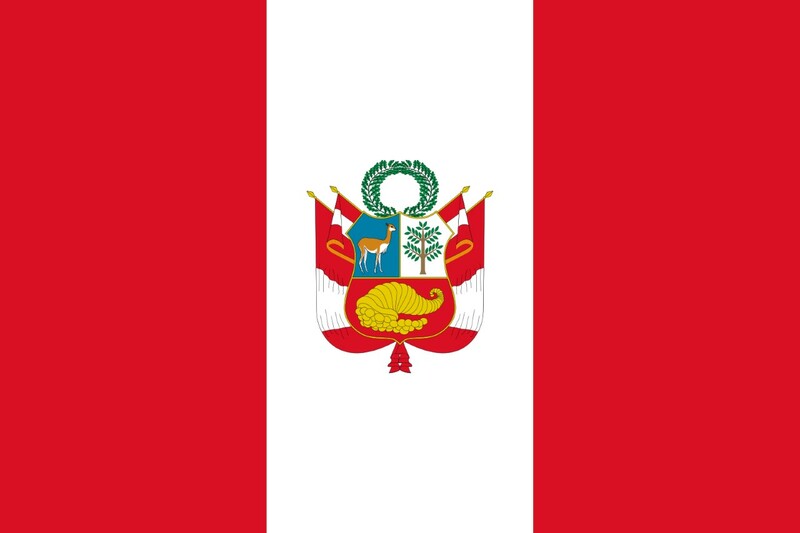 It is the national symbol of Argentina, Bolivia, Chile, Columbia, Ecuador and Peru. Each execution gave us a different perspective of the region. Off in the distance is the Andes Mountains. We learn that this part of the Andes is the only region where the mountains run east and west. 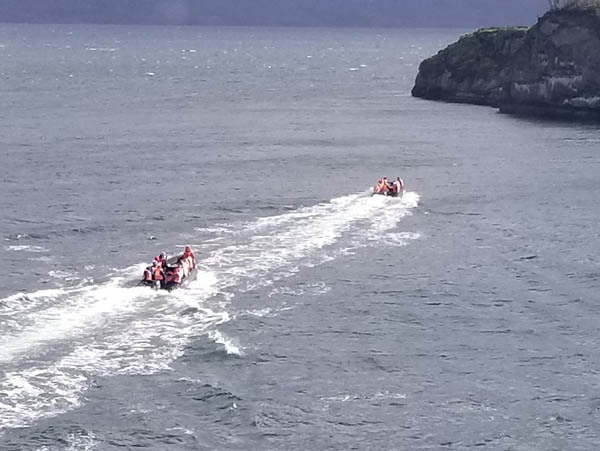 We used these onboard Zodiac boats to get from our ship to the various excursion destinations. They held 14 comfortably, along with the driver and a guide. We made sure we paired with William as our guide. Yes, in this area the world is "COLD!" Maybe one reason these glaciers still exist. This is Pia Glacier, a huge glacier that resides inside one of the many fjords that make up this part of the Andes. 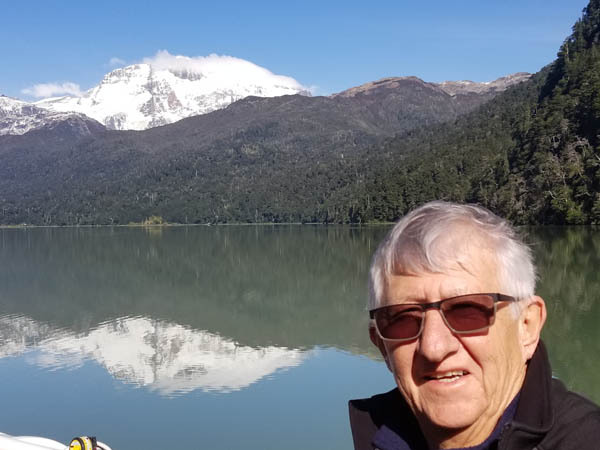 We sailed 150 miles along the Beagle Channel to an area known as the Avenue of the Glaciers where we saw a string of glaciers along the Darwin Mountain range on the southernmost range of the Andes. 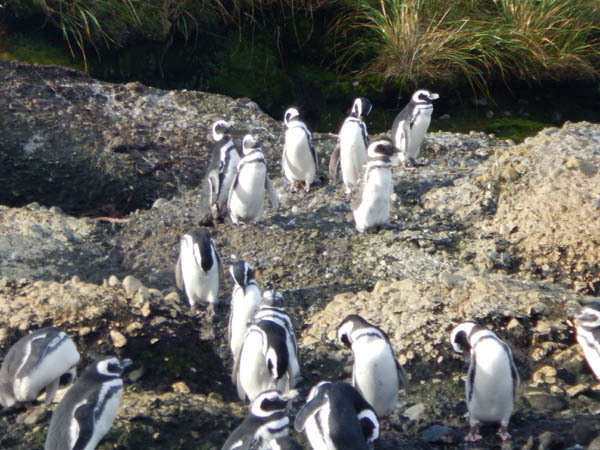 We were the last cruise of the year, thus the last people to see these penguins until next season. There were hundreds that hung out while we sat and took pictures. 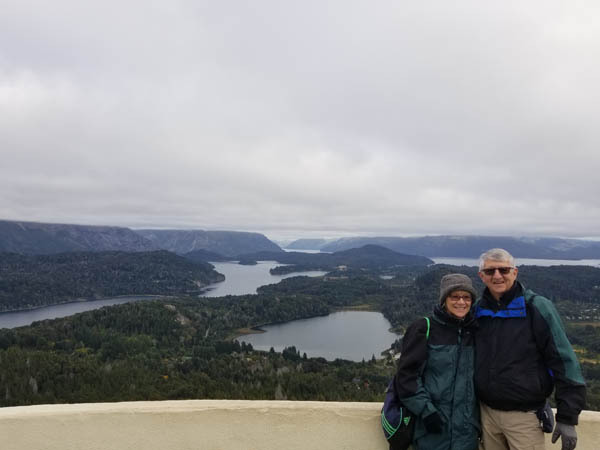 One of our goals on this trip was to step foot on Cape Horn, Chili. 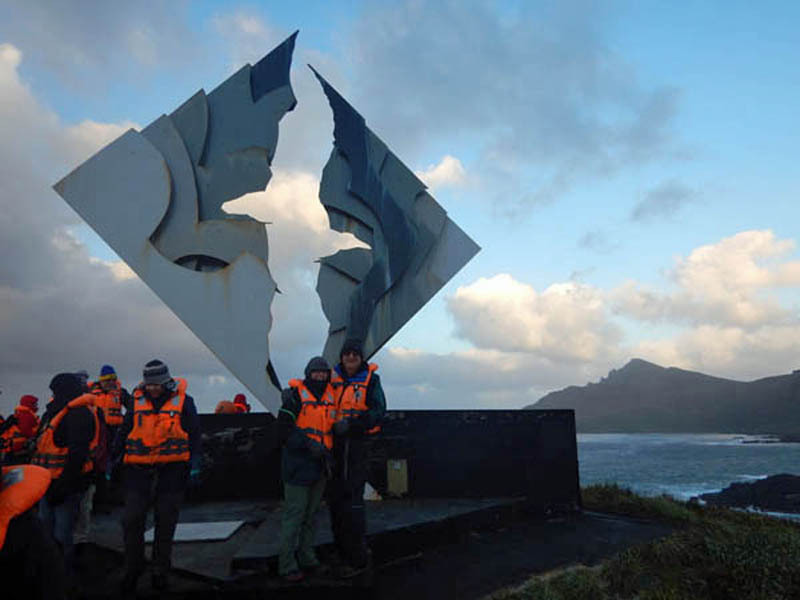 We trekked to the Memorial erected in honor of the thousands of mariners who lost their lives sailing in the waters at the "end of the world." The winds were whipping at 80 mph which cut our stay on the island shorter than expected. 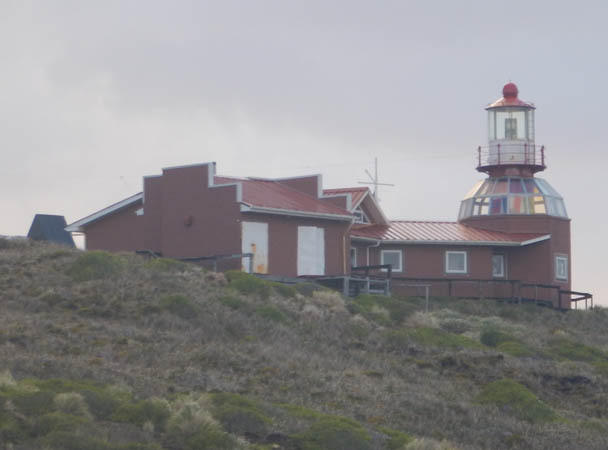 We missed the light house and a tiny chapel for the poor naval officer and his family who are assigned this post. 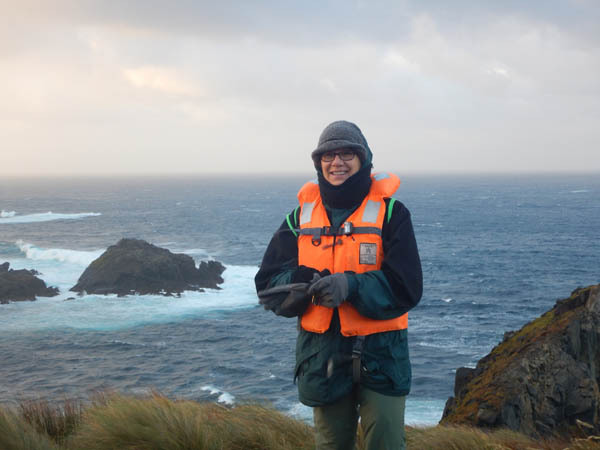 Over Glorine's shoulder, is Antarctica about 600 miles away. 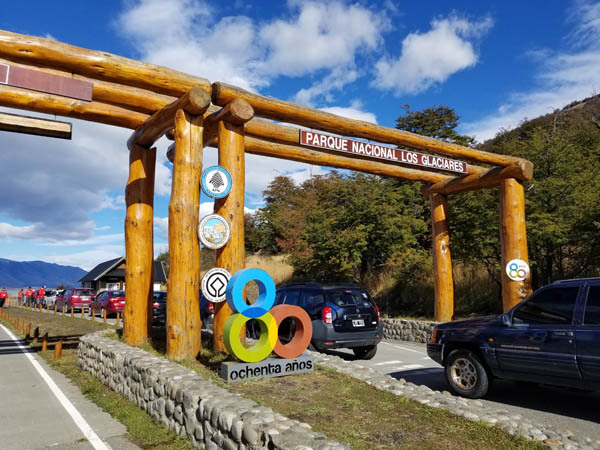 Our last stop was dedicated to Ferdinand Magellan, Charles Darwin, and Captain Robert Fitz Roy and the roles they played in shaping the history of this part of the world. The home in the distance was once a ranch house, now turned a museum. 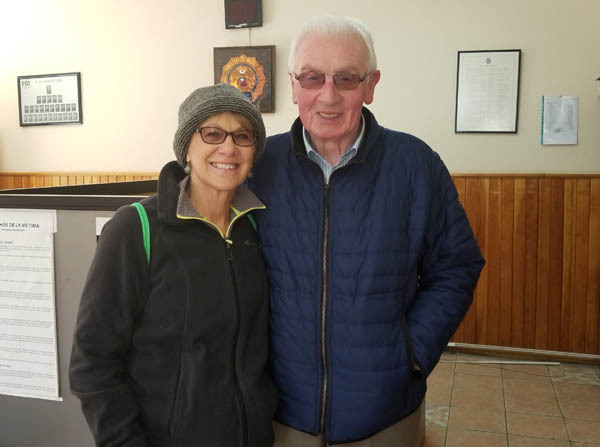 We missed our "regular" tour guide, but instead got the Director of Excursions, Mauicio Ruiz, a native of the area and an expert who shared the fascinating history of the area. An awesome tour! 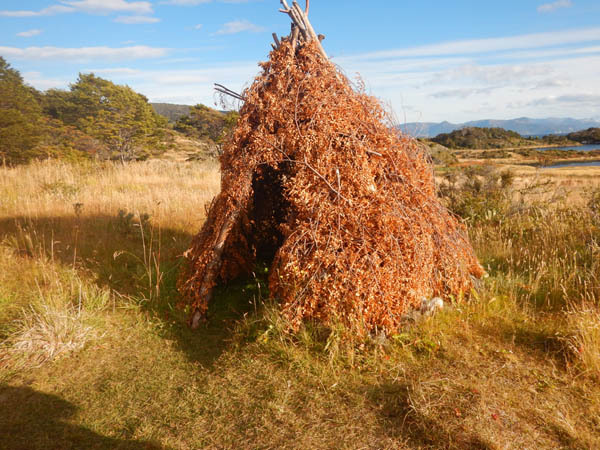 This replica teepee, was home to the Yagans, who once numbered over 1,000 residents of this area and date back to 8,000 B.C. 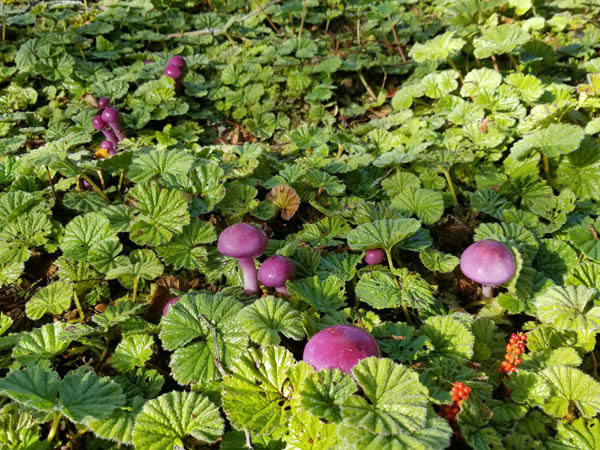 How did they survive this brutal climate? Within 50 years, they were driven into extinction. Sad! 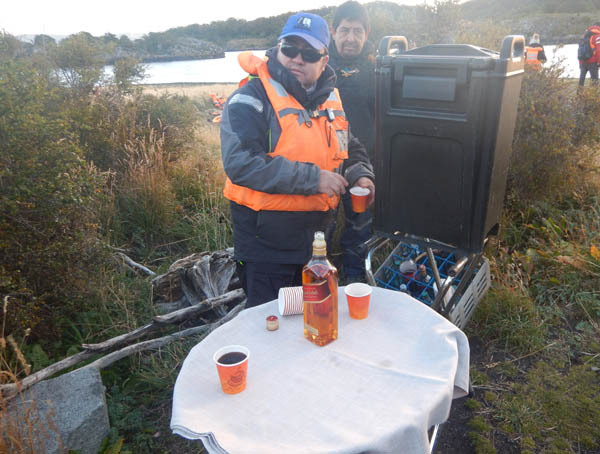 At the end of each excursion, we received a Hot Toddy, a cup of hot chocolate with as little or as much rum as we cared to have. 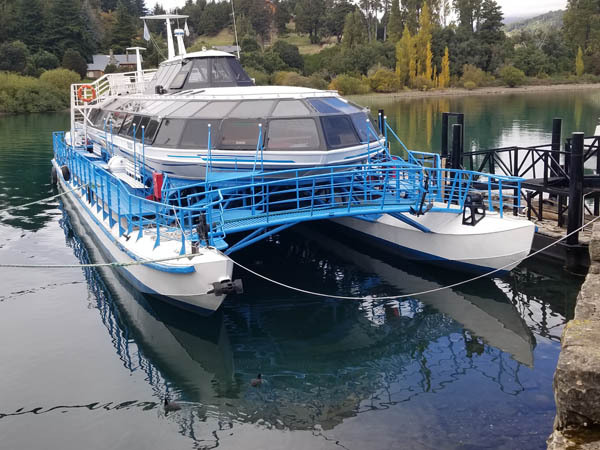 A new meaning to an all-inclusive tour. 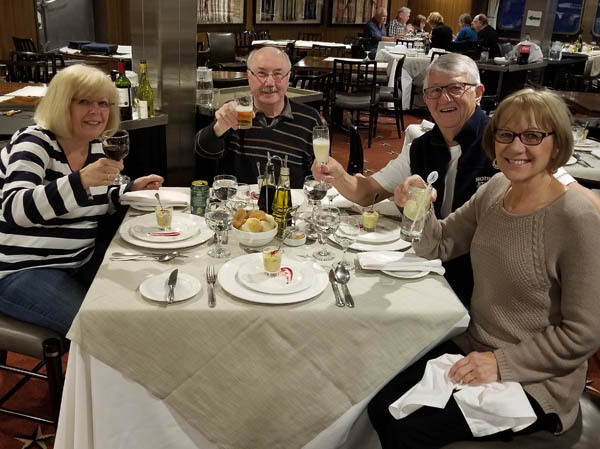 Our table mates during this cruise were Gabby and Vincentz, a German couple spending five weeks touring South America. She spoke fluent English and served as speaker and translator during our meals. 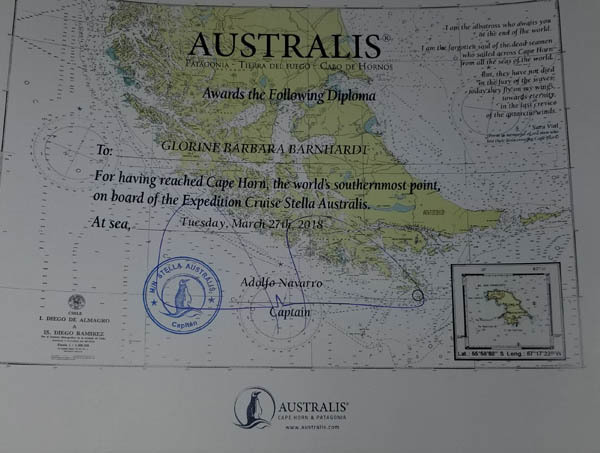 At the end of the cruise, we were presented with a diploma signed by the Captain of the Stella Australis stating we had reached Cape Horn, the world's southernmost point. 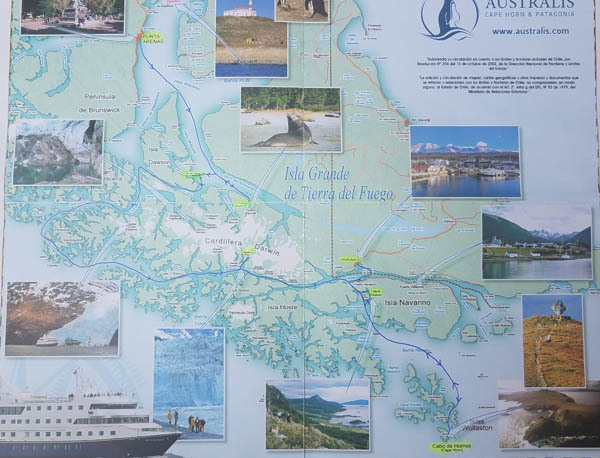 After disembarking, we spent a couple of days in Ushuaia, billed as the southernmost city in the world. 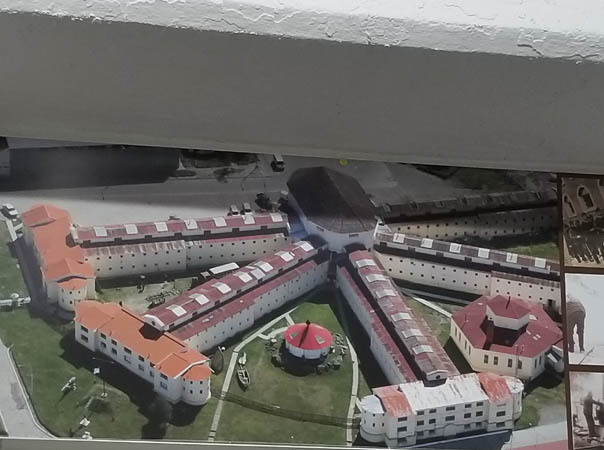 It began as a penal colony for hardened criminals, who provided the man-power for public works projects. 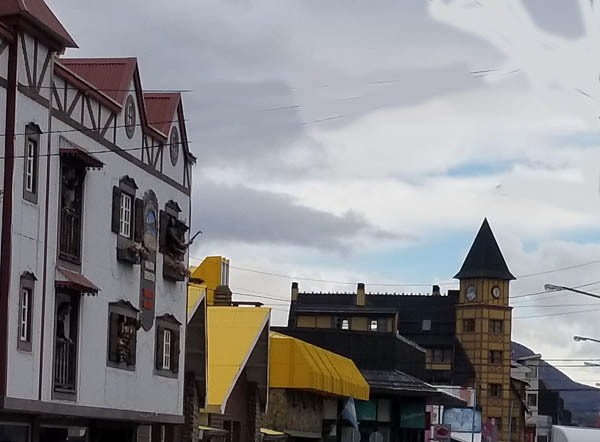 Since the prison closed in 1947, Ushuaia is home to European immigrants who have transitioned this town into a tourist center, with a Swiss/German feel. 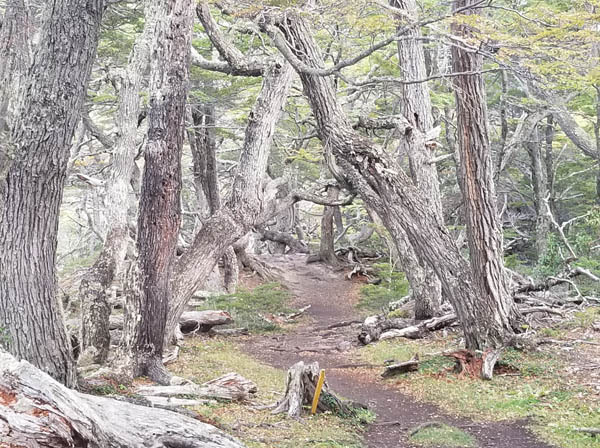 Tierra del Fuego National Reserve is located near Ushuaia and where we decided to take a 12-mile hike through this dense forest. 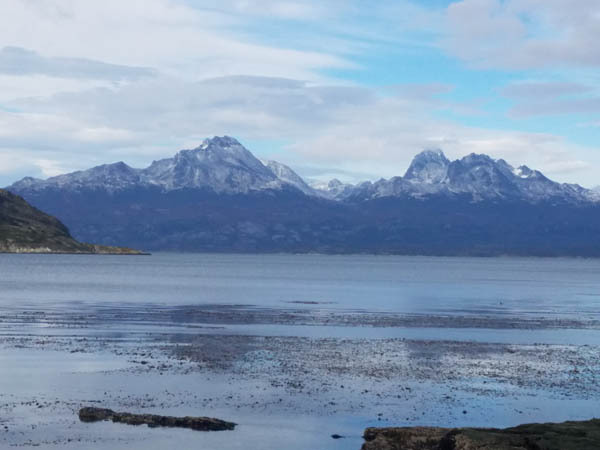 The hike also treated us to some grand views of the Andes along the waters of the Strait of Magellan. Hard to believe we put on that many miles. 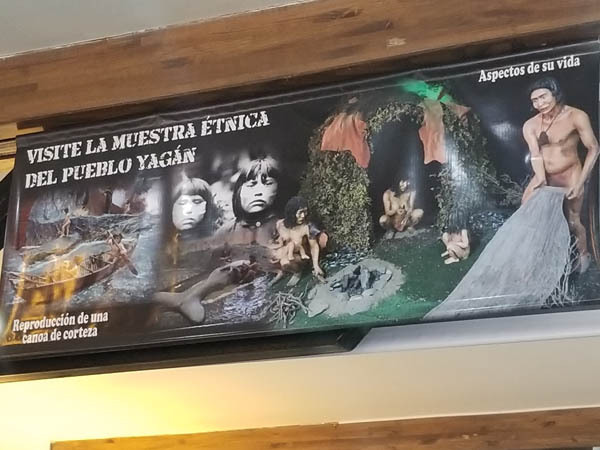 At the end of the hike, the National Reserve housed a small museum featuring the now extinct indigenous people who were hunted and gathered in this area. 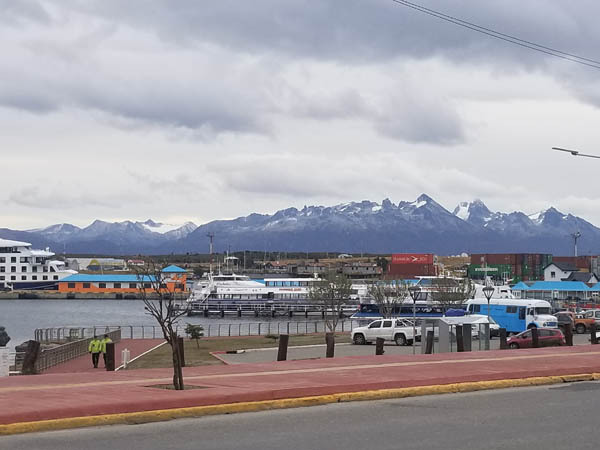 Ushuaia has become a popular tourist destination thanks to the cruise ships that sail around the tip of South America, day trips through the Strait of Magellan and tours to Antarctica. 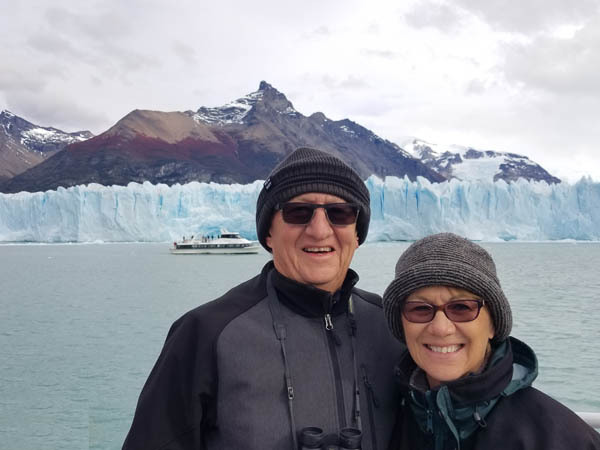 From Ushuaia, we flew to the city of El Calafate to tour the National Park of the Glaciers, the largest in Argentina, covering nearly three million square miles. 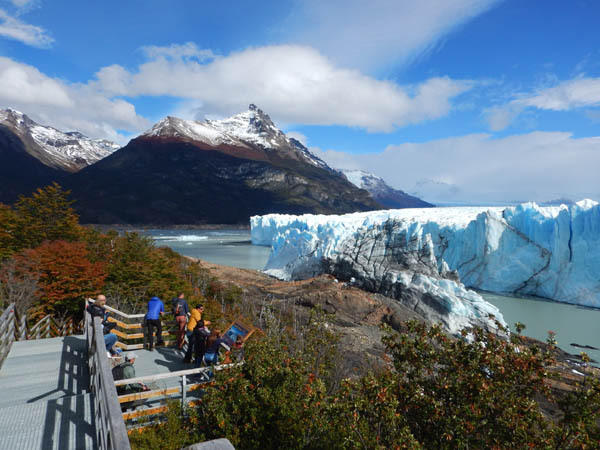 It is the home of Perito Moreno, one of South America's most popular tourist attraction. 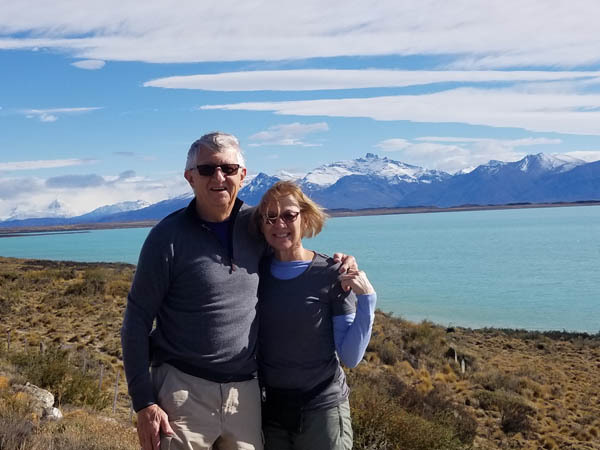 As we entered the Park, we stopped for this photo op by Lake Argentina, the largest lake in Argentina, with the snowcapped Andes in the background. 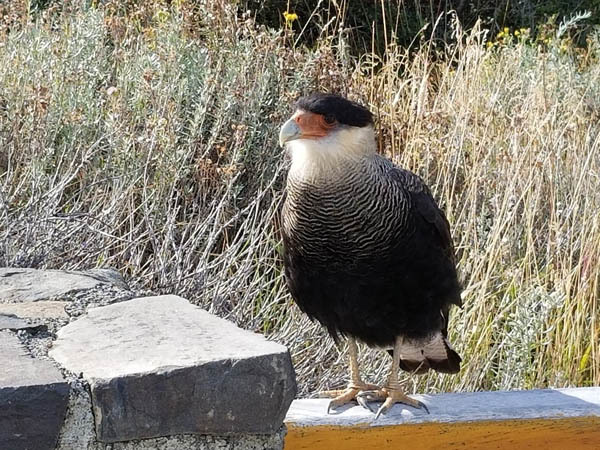 We caught this picture of a Southern Crested Caracara, a bird of prey that is a cousin to the Falcon and only found in southern South America. 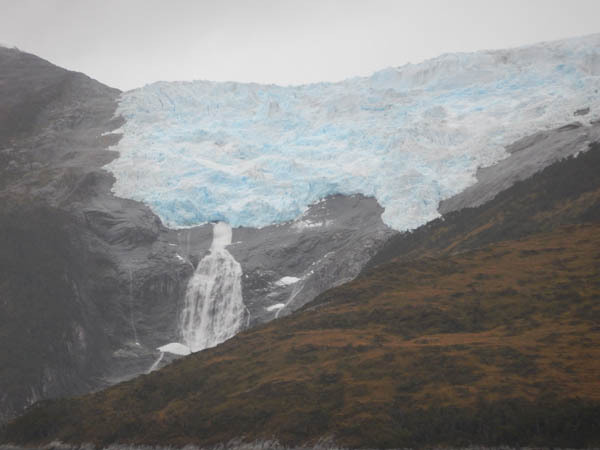 These pictures will not do justice to how overwhelming this glacier truly is. 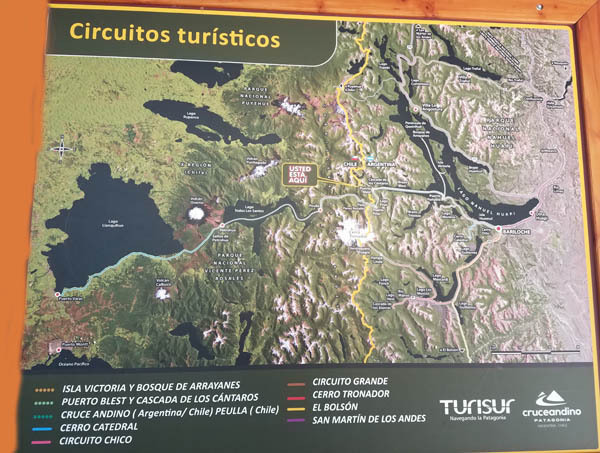 It is larger than the city of Buenos Aires, nearly 100 square miles, 560 feet thick, 20 miles long and three miles wide. Click to view. 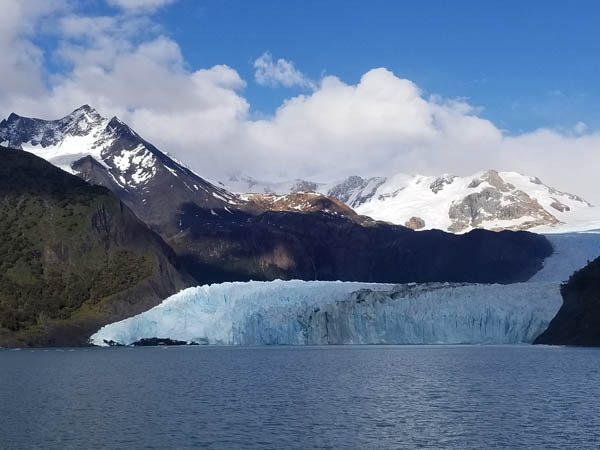 To give some perspective to how large this glacier truly is, we took this picture of a 200-passenger boat on the lower right, moving toward the glacier. 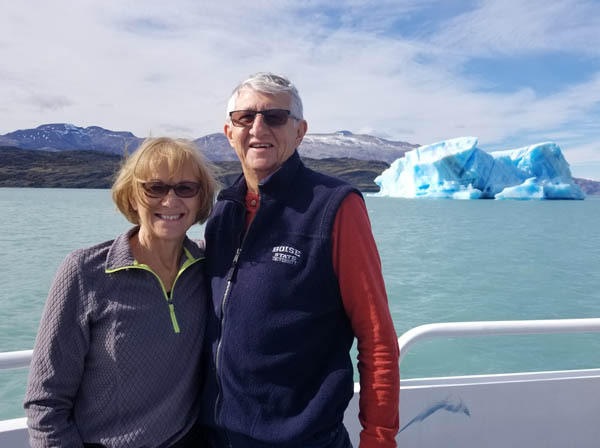 We took a boat cruise to get a close-up view of the glacier. We used our zoom lenses to get a closer view of the glacier. These columns will soon be calves floating in the lake. We heard many smaller calvings, but by the time we turned to view it, it had already hit the water. 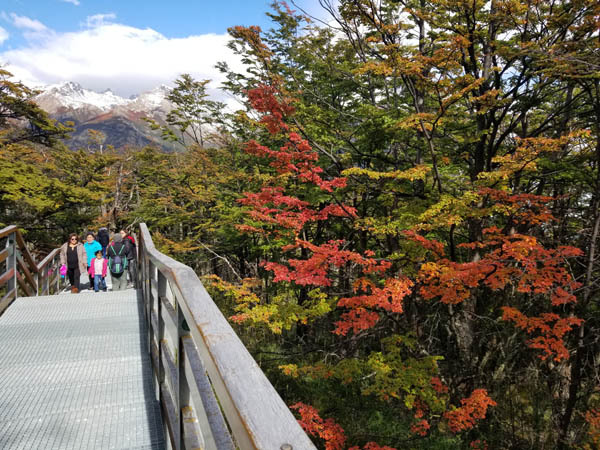 The national park was kind enough to build miles of walkways and balconies for us to view the glacier and its surroundings. Note this is the beginning of April and the trees are turning colors. 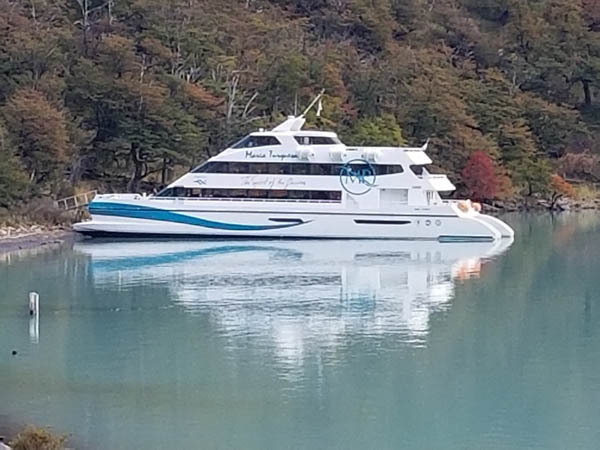 We took this 200-passenger tour boat to Los Glaciers National Park. 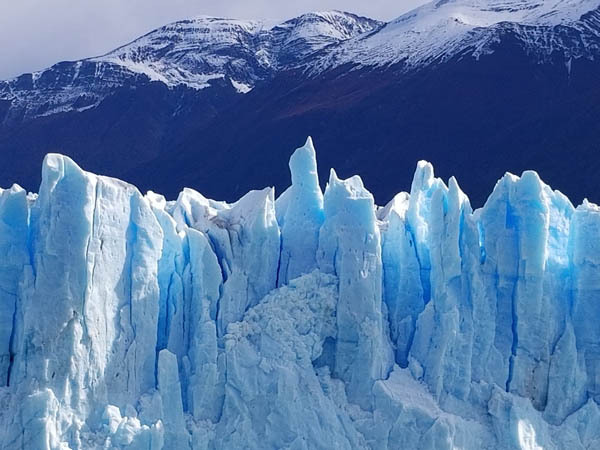 Together with its sister park in Chile, Torres del Paine makes the South American ice field, the third largest in the world, behind Greenland and Antarctica. Spegazzini Glacier is one of several glaciers we sailed by. It is not as large as Moreno, but its sheer size of the wall which is 440 feet above the water line, make it so impressive. Our tour included a secluded farm house. When the Park was created 80 years ago, farmers had to move off, but some of their cattle were left behind. Now numbering over 3,000, they have become a serious problem and will be removed. 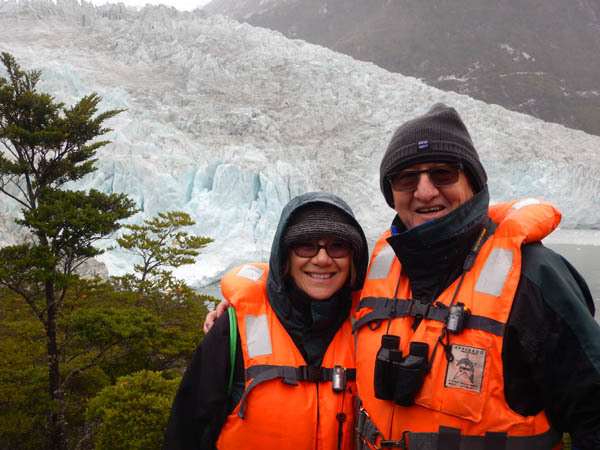 The enormous iceberg behind us is one of hundreds floating in Lake Argentina. Many are larger than the ship we are on. And the interesting thing we learned is that 90 percent of the iceberg is below the water line. 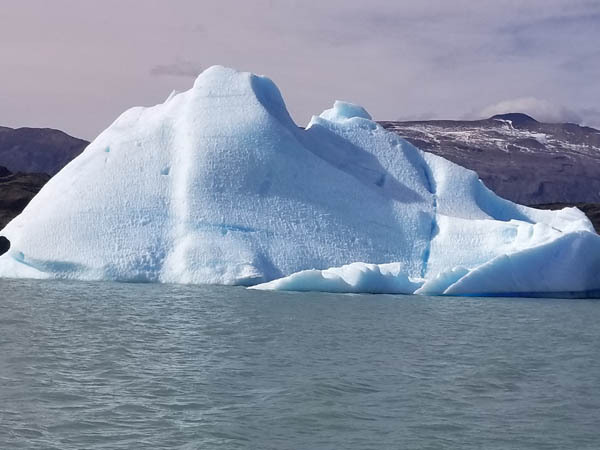 We were astonished by the number and the size of icebergs slowly floating downstream. 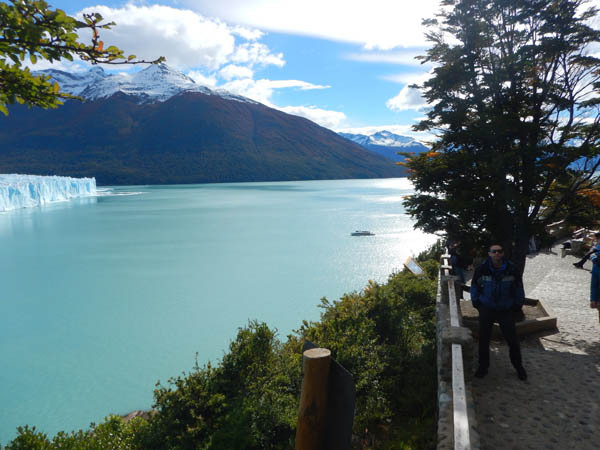 This is Perito Moreno. The cruiser behind us shows the unbelievable size of that glacier. Awesome!! 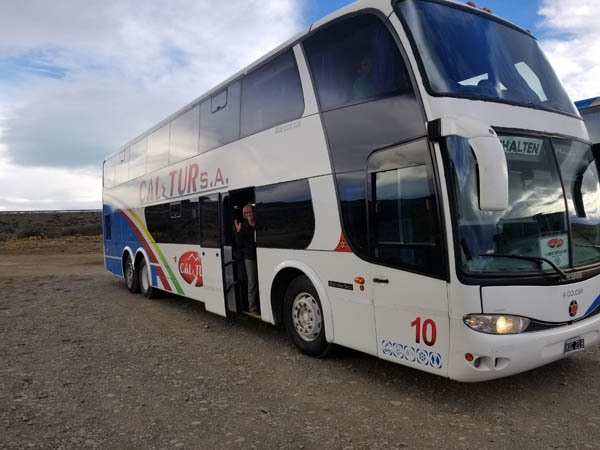 The next day we took this bus to El Chalten, to tour Mount Fitz Roy, which shares a border with Chile. Picture perfect. But that is because it is a picture of a picture. Later you will soon learn why. 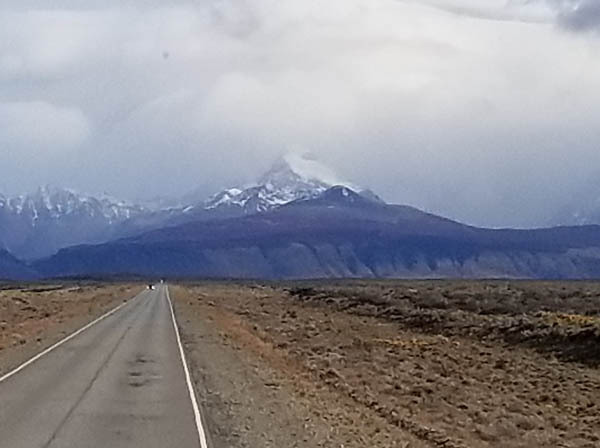 As the bus got ten miles from the mountain, we took this picture and had our fingers crossed that the storm would blow over. 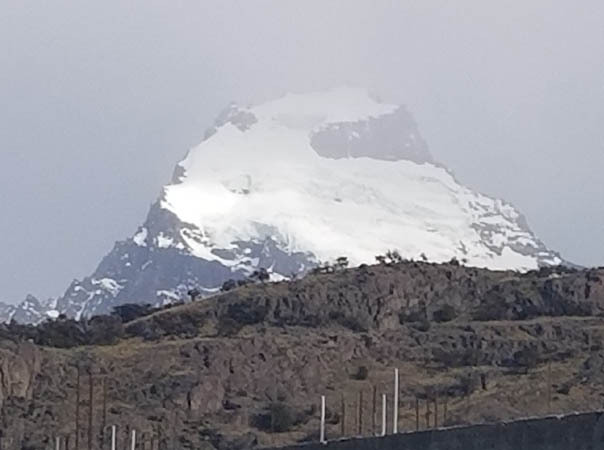 At El Chalten National Park office, we grabbed this picture of the face of the mountain and began a four-kilometer trek to get a closer view. 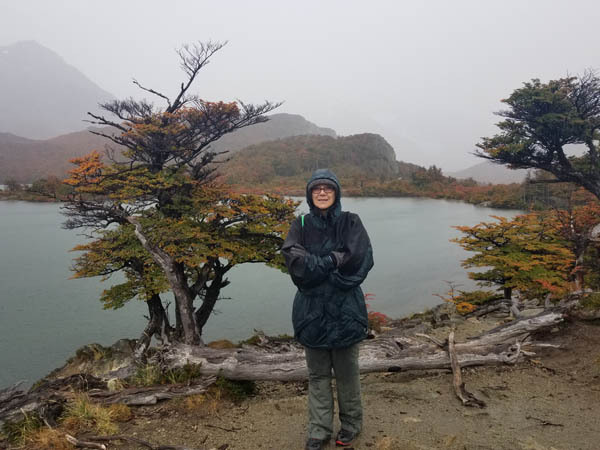 When we got to the viewing point, it was pouring down the rain and we took this picture of Glorine soaked to the bones. And we had 4KM to go to get back to town. 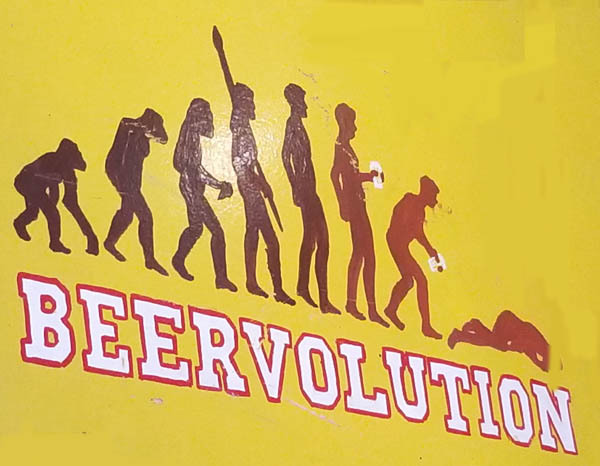 We sat in a bar, next to a laundromat waiting for our clothes to dry and laughed at this wall hanging with their version of evolution. 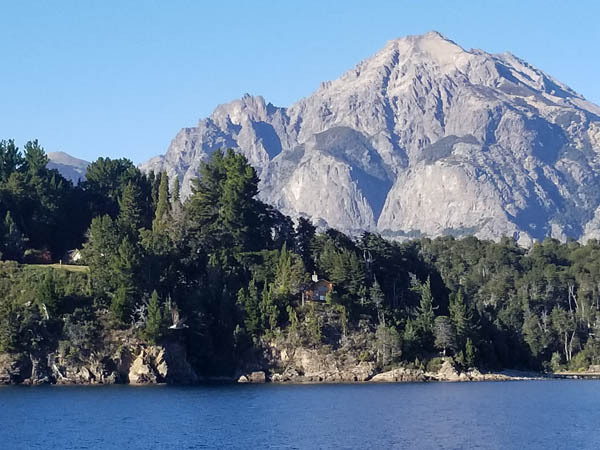 From here, we took the bus back to El Calafate and flew to San Carlos de Bariloche, Argentina. 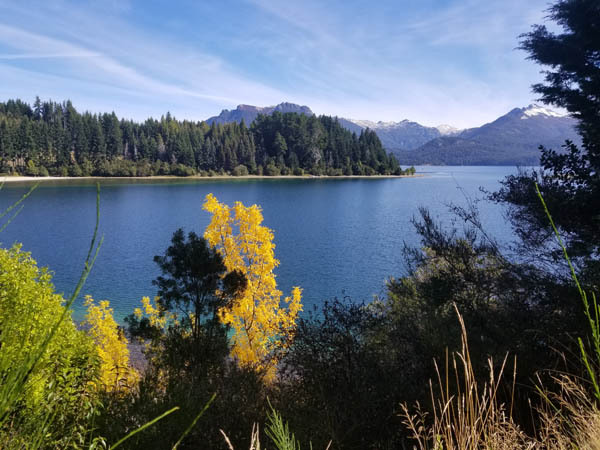 San Carlos de Bariloche has a German and Swiss influence as they were the first settlers to arrive in the late 1800s. The Festival of Chocolate coincides with Easter. Signs and decorations of the Festival were all over the plaza. 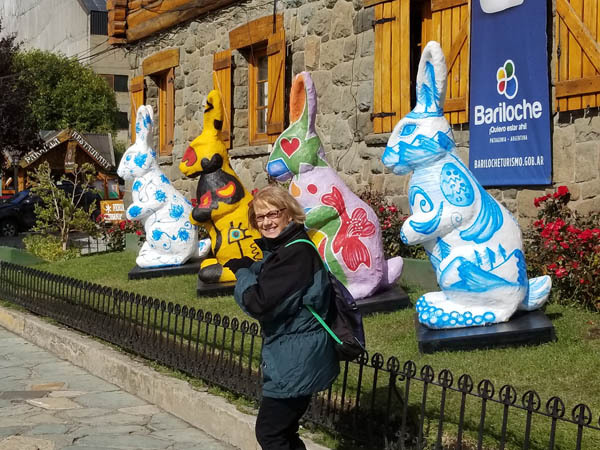 Giant bunnies painted with different colors and patterns were placed throughout the plaza. 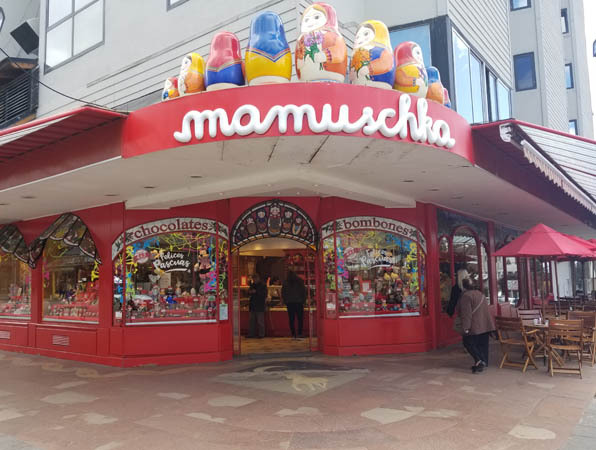 The city even has its own Chocolate Museum. 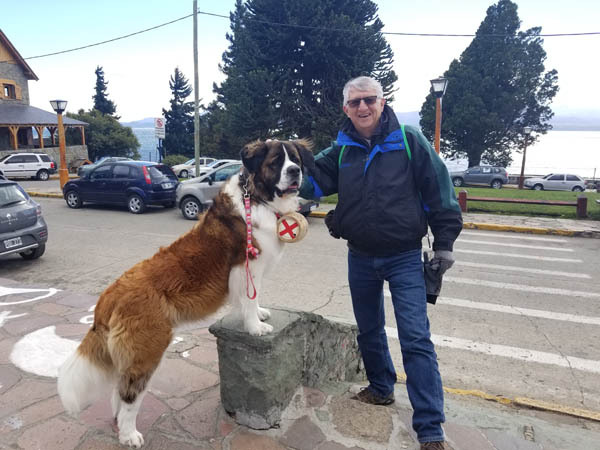 Larry, thinking his name came from Saint Bernard which this dog is named after, couldn't resist paying to have his picture taken. Note the large lake in the background. And chocolate stores were located all over. 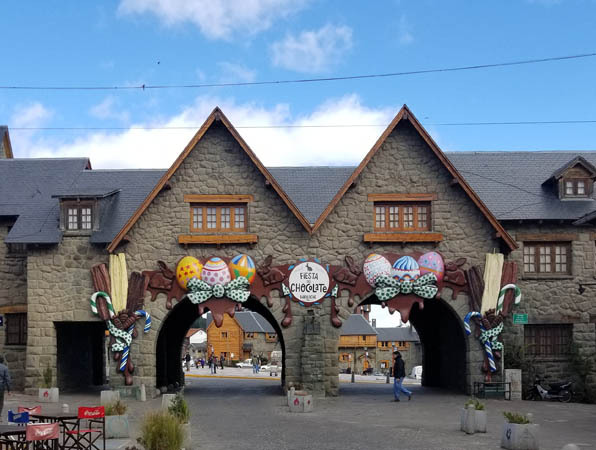 Everyone living here must have a sweet tooth to keep these businesses open year-round. 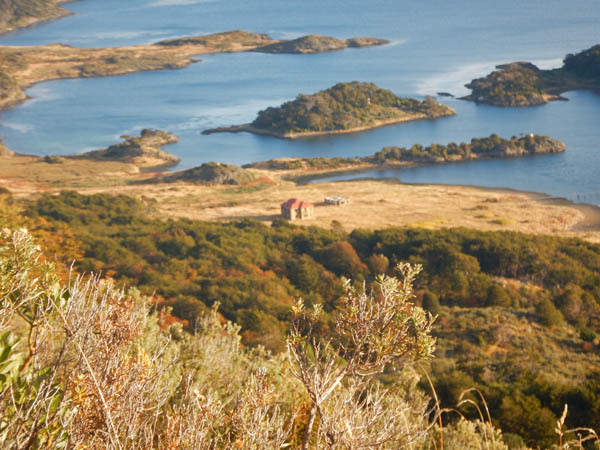 Bariloche is home to the Catedral Alta Patagonia Ski Resort, one of the country's largest. While already cold, the snow is not expected until late-April. 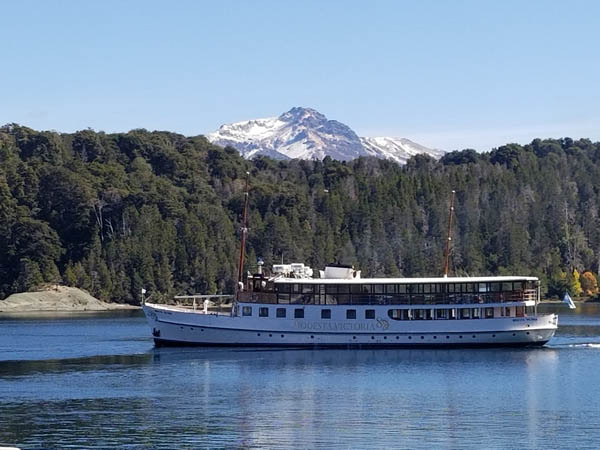 We used this 1937 vessel for our tour of Lake Nahuel Huapi that has a national park. This crystal-clear lake is about 200 square miles and an average depth of 500 feet. 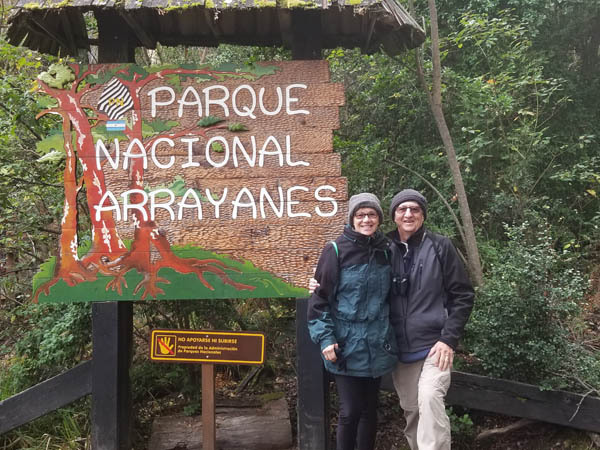 This National Park is dedicated to preserve the Arrayanes Trees, which is a unique tree that only exist in this part of the world. 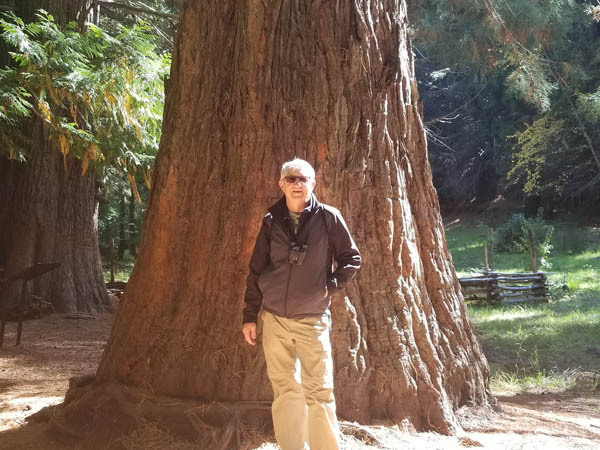 While touring the park, we learned that they also transplanted trees from different regions of the world including this Sequoias Tree from California. Two things that made this tree so unique was the color and the fact that it has no bark. This fence is made from the wood of the tree. 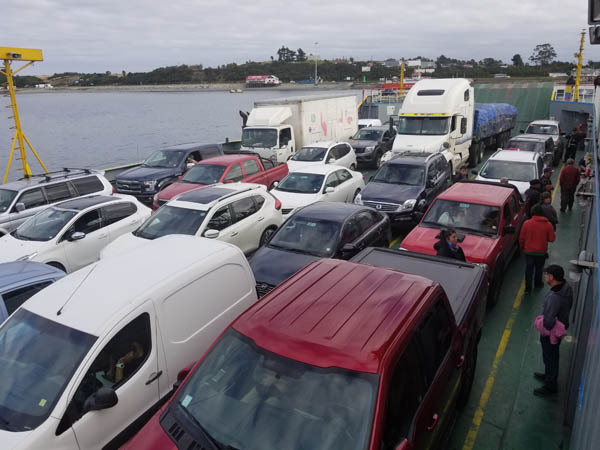 We had an awesome border crossing over the Andes Mountain range from Argentina to Chile, leaving Bariloche at 7:00 am and getting into Puerto Varas at 6:00 pm. 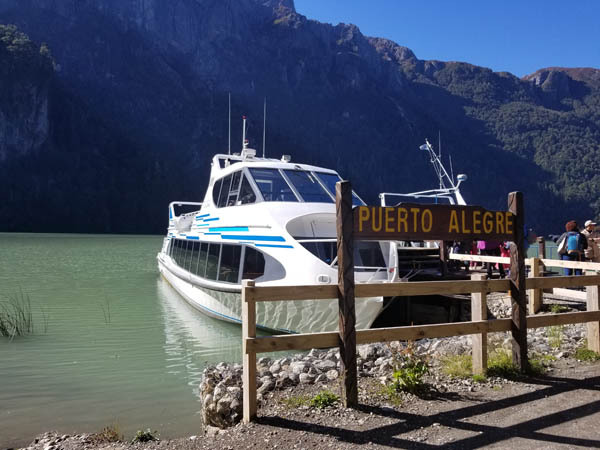 This trip required us to take a bus, boat, bus, boat, and bus. The scenery was spectacular on both sides of the border. This was one exciting way to explore the lake district on both sides of the Andes. 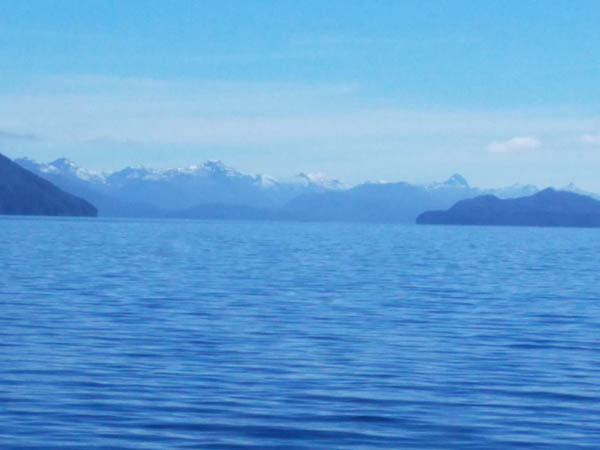 The waters were pristine and the snow-capped mountain spectacular. 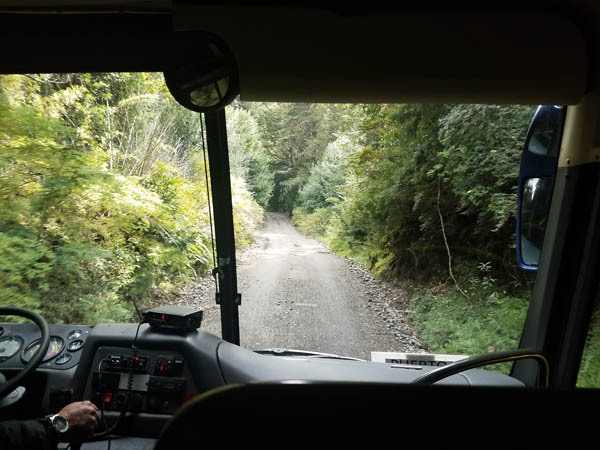 Getting from boat to boat was by bus, but through the jungle on dirt roads. 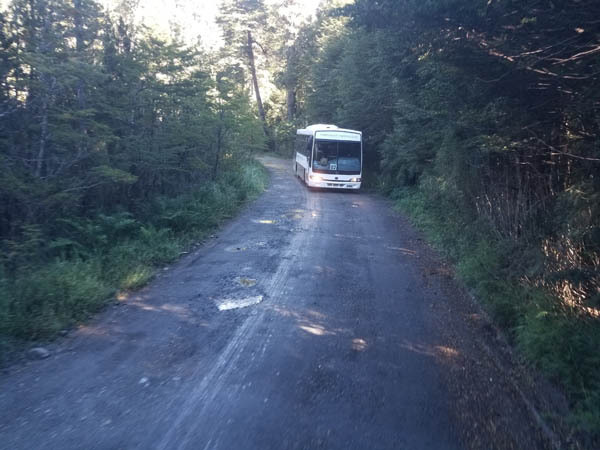 There were two busloads of people on this adventure. After a half hour of a bumpy bus ride, we arrived at our next port where this cruiser was waiting for us to arrive. 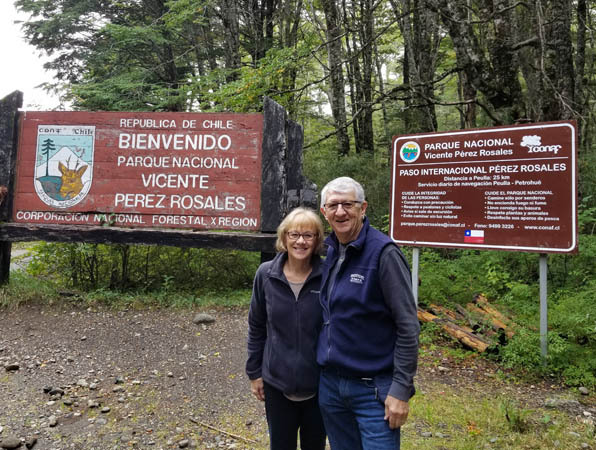 After a remarkably short cruise, we took another bus ride over more graveled roads for this photo op at the Chilean border at the top of the Andes Mountains. Down the road a bit, we all went through immigration and customs at this little out back. 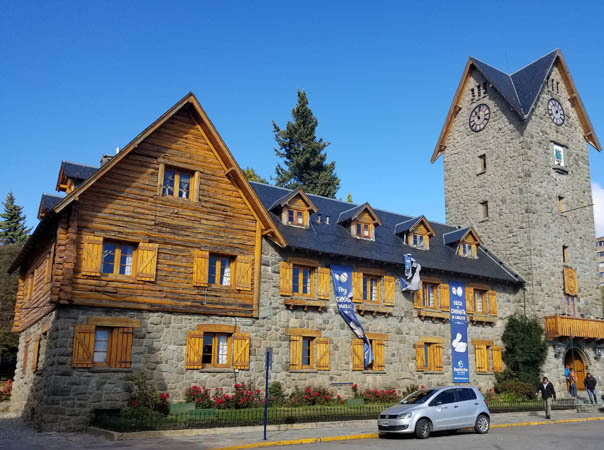 Our next stop was Hotel Peulla--the Gateway to Patagonia. This enormous structure is in a community of 120 people which can only be accessed by boat. 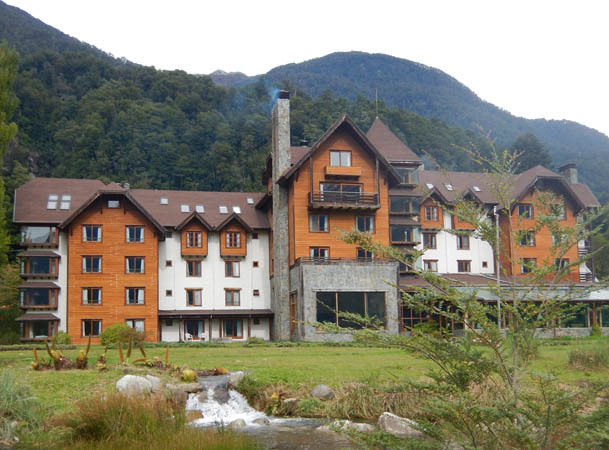 A true nature get-away in the Chilean Lake District. 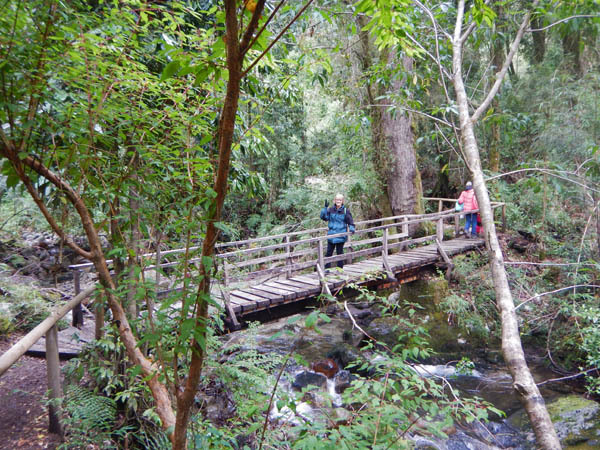 After some drinks at the restaurant, we took a hike along a gravel path crossing several bridges before getting to a small, but cool waterfall. 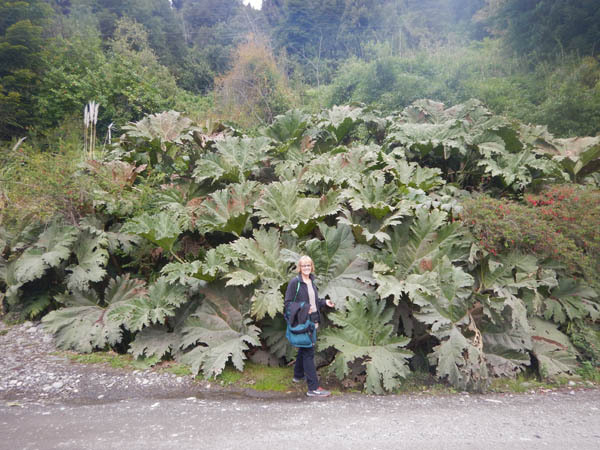 How many rhubarb pies do you think this Chilean Prickly Rhubarb plant will make? Locals use the stalk for jam or they eat it with salt. We hiked a short distance from town to board our last boat of the day on Lake Todos los Santos (All Saints), which has depths of over 1,100 feet. More spectacular snowcapped mountains. Remnants of 25,000,000 year-old eruptions. 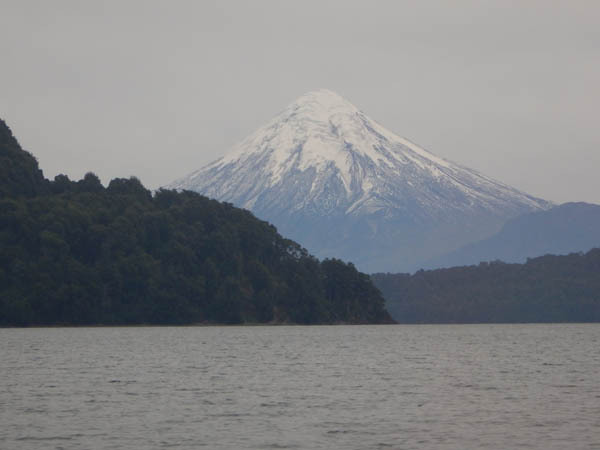 One of four volcanoes that can be seen from the lake. 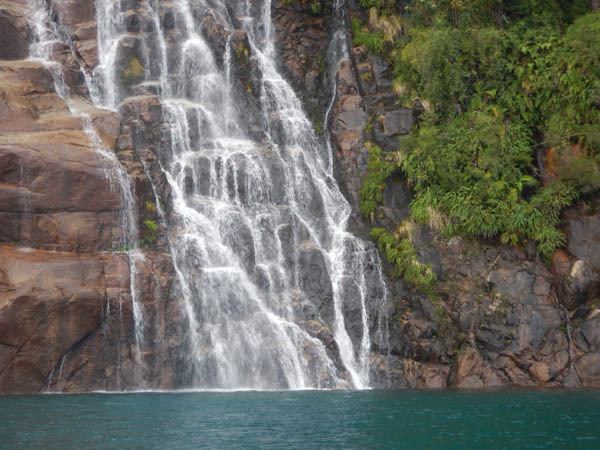 One of many beautiful water falls. 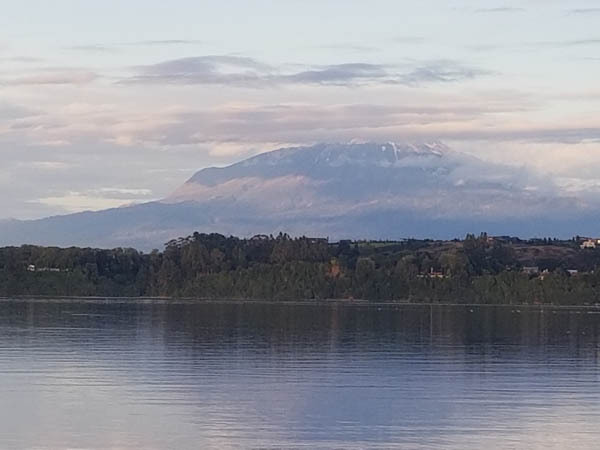 As we turned into this channel of the lake, we got our first glimpse of Osorno Volcano, one of the most active in the southern Andes. After more stunning views, we took our last transport over more gravel roads. 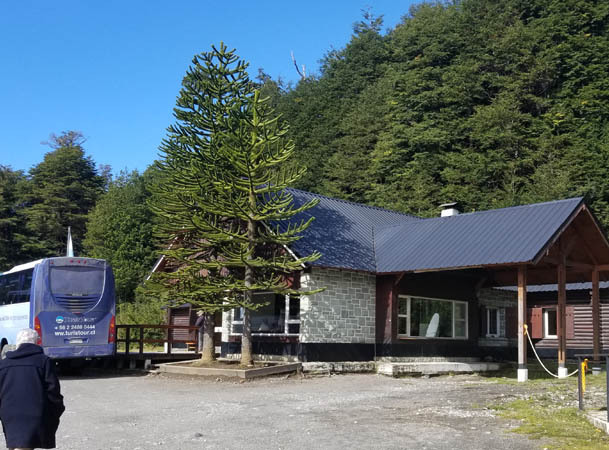 Eventfully, we would travel on a paved road for the trip into Puerto Varas. 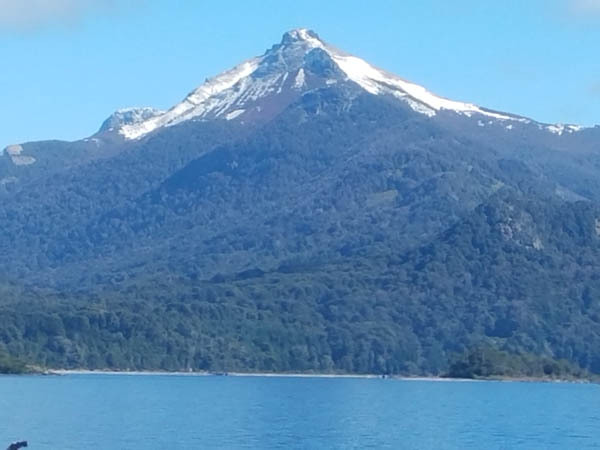 Views from the bus along Lago Todos del Santos. 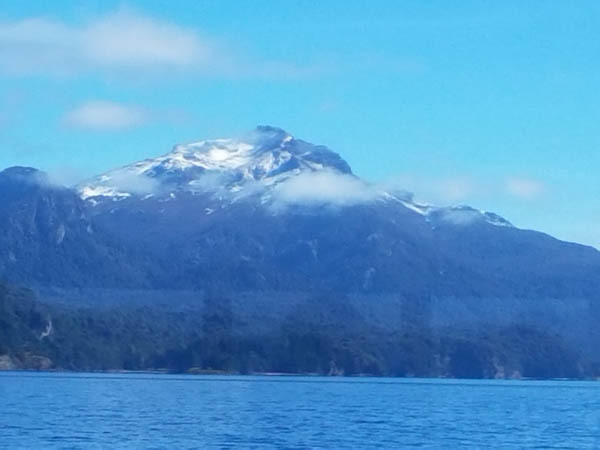 As we were getting closer to Puerto Varas, the clouds were starting to cover Osorno Volcano. 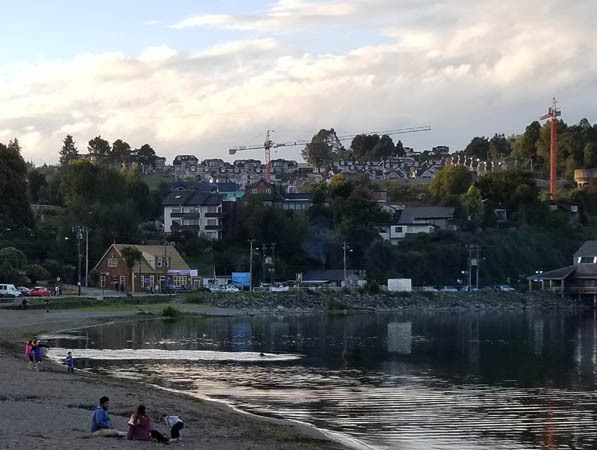 Puerto Varas is another tourist community with a look and feel of Switzerland. 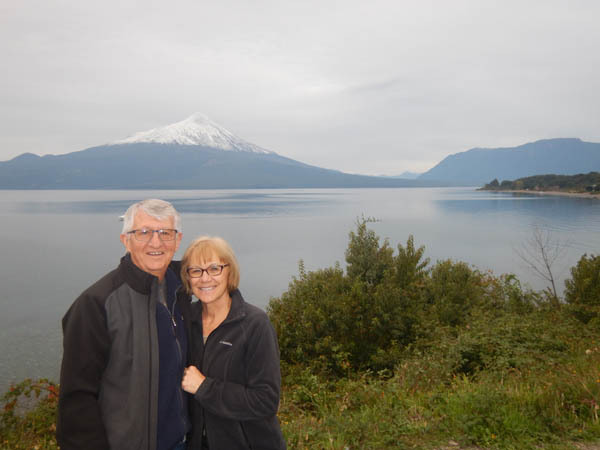 While touring the lake front of Puerto Varas, we took advantage of this photo op. 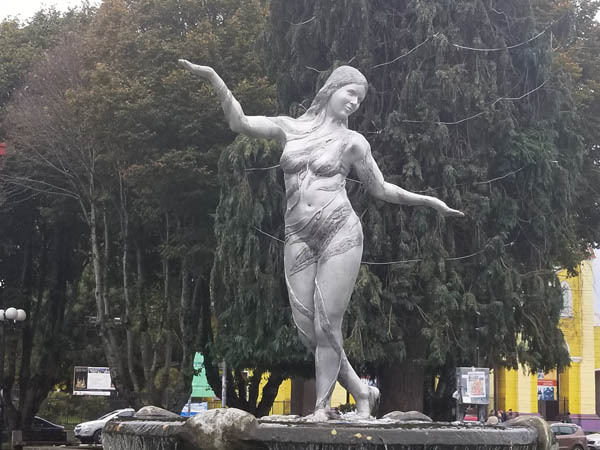 While a little on the chilly side, Chilean's don't mind it. 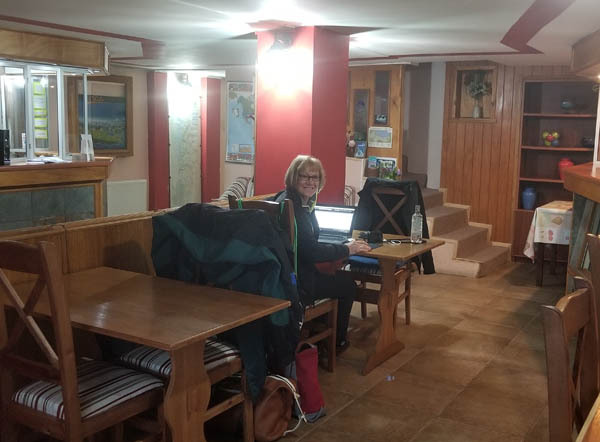 We sprawled out in the common area of this hostel we called home for a few days--mostly website and family activities. 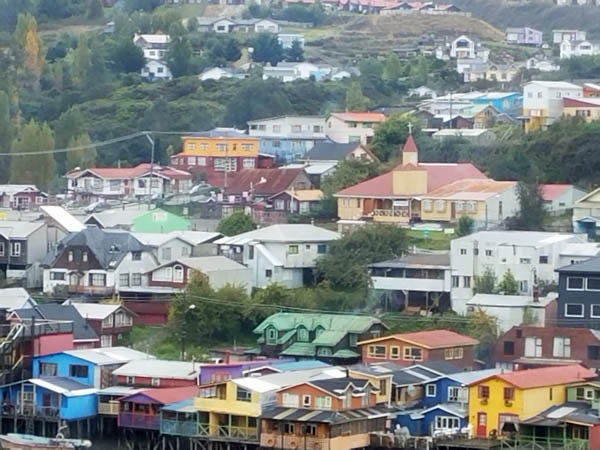 One of the most sees of the area is Chiloe Island, which was a ferry hop away. It is the largest of what makes up the Archipelago on the Pacific Coast (a group of islands). 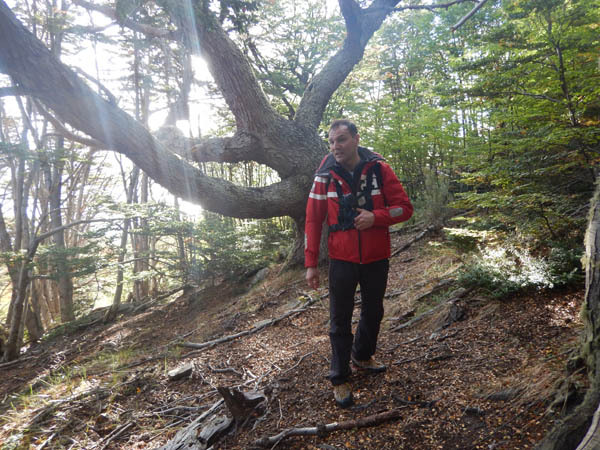 The tour of Chiloe Island focused on how the people live much as their ancestors did. 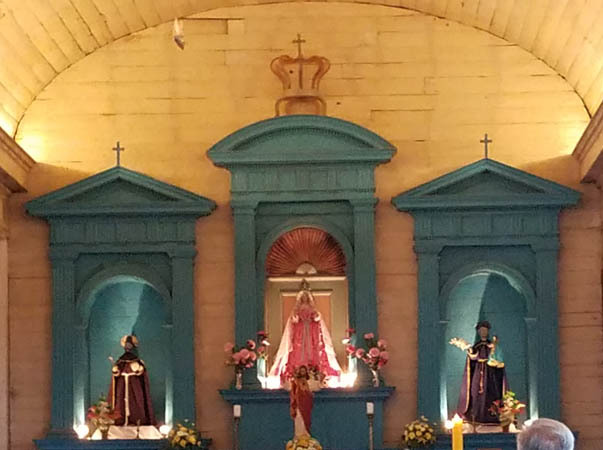 This is one of four Catholic churches built by the Jesuits in the 1800s. This church was packed. 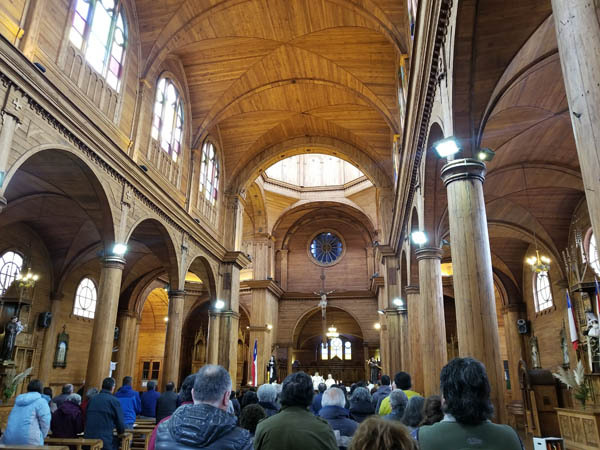 While most Catholic churches throughout Chile are declining in Sunday attendance, they are maintaining post-Columbia traditions. And at the same time many indigenous descendants have held on to pre-Columbian beliefs like finless mermaids protecting fisherman. 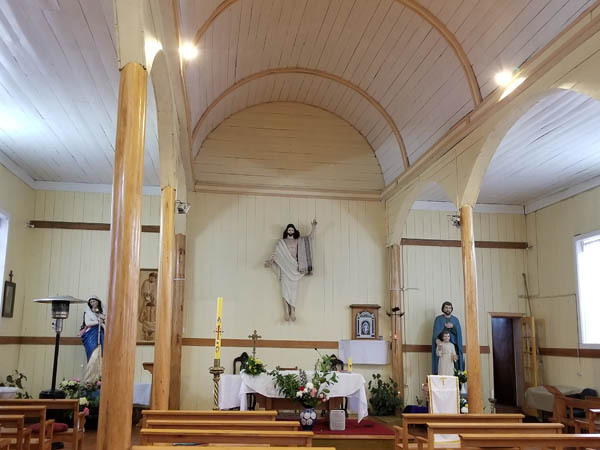 The ceilings of these churches are up-side-down boats. Hanging miniature boats for those that died at sea is a tradition that brings greater peace to the families. Castro is the largest city at about 40,000 and they love their colors. Palafitos are homes built on stilts to deal with the constant tides. One of the buildings was a restaurant we ate at. 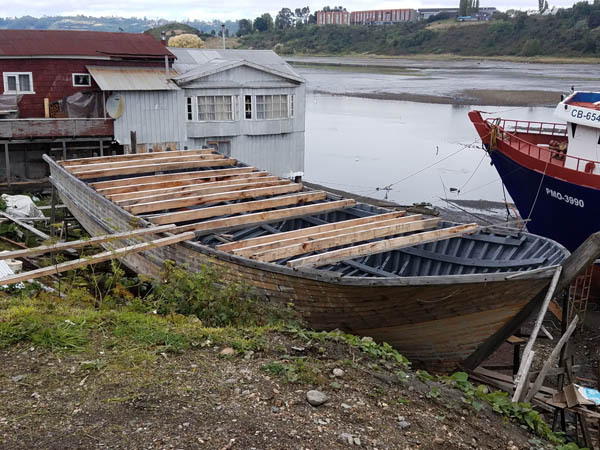 This wooden fishing boat is under construction and one of many sitting as a work in progress. 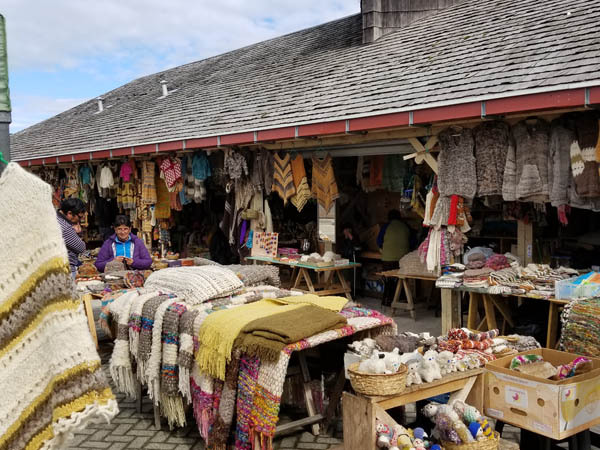 Sundays consist of going to church and handicraft shopping at the market. Nothing here made in China. 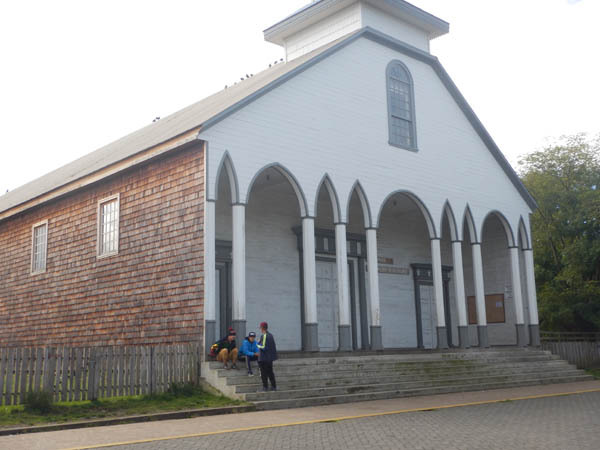 We stopped at one last church on our way back to the ferry, unfortunately it was closed. 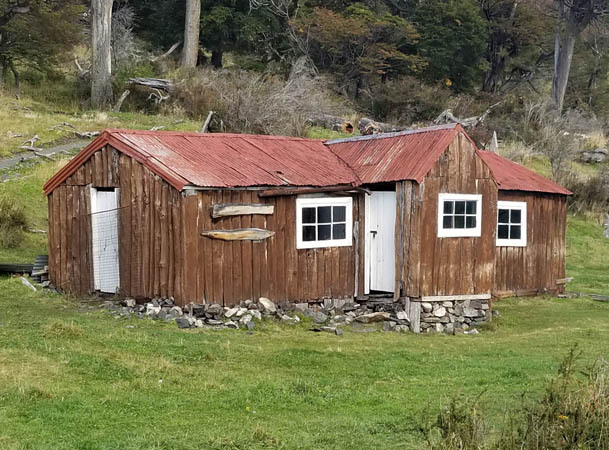 It too was a wooden building. 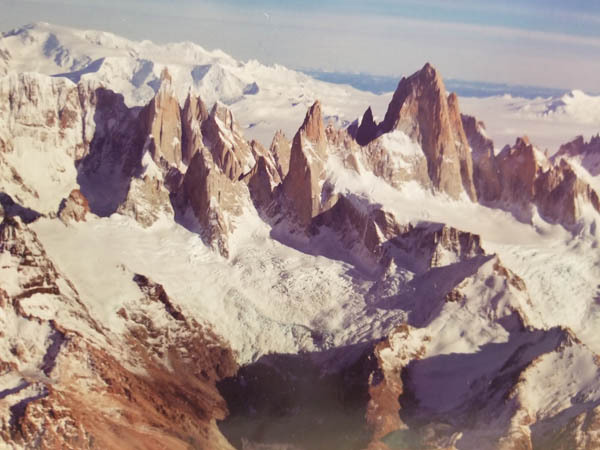 Patagonia's web page includes March 21 through April 9.